We love the colourful and dramatic artwork by Chantrell for 60s sci-fi classic. Voyage to the Bottom of the Sea. A scare and wonderful poster. Professionally cleaned, de-acidified and linen-backed. 30 x 40 inches (31 x 41 inches including linen-backing). Touch up to typography in places and folds. 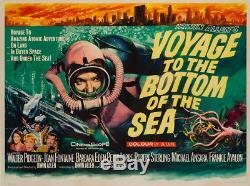 The item "Original Voyage to the Bottom of the Sea, UK Quad, Film/Movie Poster Chantrell" is in sale since Friday, September 22, 2017. This item is in the category "DVDs, Films & TV\Film Memorabilia\Posters\Originals - UK Quads\1970s".